Every so often when the Moon is especially ginormous or we can see Venus or Mars from Earth, humans collectively freaks out. So cool three exclamation points, we scream. Look how big with thirty i's, we yell. And it's warranted! Seeing things that don't belong in the sky pop up, well, in the sky is fun. 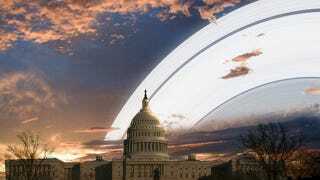 So could you imagine if one day Earth developed rings like Saturn? It would be insane. Amazing science and space artist Ron Miller imagined what life on Earth would look like if it had rings like Saturn and it's mind blowing. The coolest thing is that different areas of the world would see Earth's rings differently—a streak of light dividing the sky at the Equator, a bending ring that looks brightens the Moon in Guatamela, a permanent rainbow on the east coast of the United States and so forth. I want to live on this make believe planet now. Earth is too ordinary. In Polynesia, Earth would cast a shadow on the rings creating a warped ring. Near the equator, the rings would be a streaking light splitting the sky. Probably the most beautiful looking view of the ring would be in Guatemala.